Is a skim cappucino a mummy drink? What’s your caffeinated beverage of choice? Is a skim cappucino a mummy drink? Recently, for health reasons, my caffeinated beverage of choice has moved from a skim cappucino to a long black. I seem to have noticed, and it may just be my perception, that the baristas of Sydney are treating me with a little more respect. A little eye contact, a cursory nod as they hand over my morning cup of energy. I wonder what my change means to them? 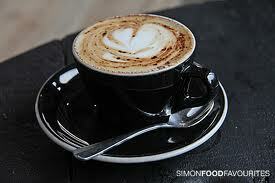 It made me think – is a skim cappuccino the drink of mums? Have I been communicating – through no other mechanism than my breakfast order – that I am a mum? All this time I thought my work clothes, heels and makeup allowed me to shrug off my suburban mum ways and appear, even just during daylight hours, to be a part of the inner city trendiness that is my work community. Have I been uncool all this time? Have I become more cool by giving up dairy? What’s your caffeinated beverage of choice?